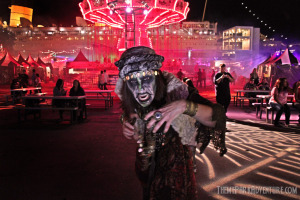 On Thursday, October 2, The Queen Mary’s Dark Harbor unleashed a spectacle of new haunted spirits, mazes and attractions that landed the annual festival on the Travel Channel’s list of the top ten haunts in the world. Nightly Dark Harbor attracts thousands of brave thrill seekers and continues to experience record-breaking attendance growth annually making it the fastest growing haunt in Southern California. This year the annual haunt unveiled three new terrifying mazes. B340 and Soulmate depict the true torrid tales of two unfortunate Queen Mary passengers of the past. Samuel the Savage and Graceful Gale both haunt the cruise liner and take Dark Harbor guests on a horrific journey through their insanity and demise. The new Voodoo Village maze summons the Voodoo Priestess to arise from the swamps with her band of gypsies and witch doctors to taunt guests and control all mortal and spirit souls. The all-new Encounter experience unveiled at Dark Harbor 2014 invites a very small number of lucky (or unlucky) guests on a top-secret paranormal journey in the most intimate and frightening caverns deep within the Queen Mary ship. The Monster Midway offers the new thrilling Sinister Swings ride and welcomes back the Bucking Monster Ride and the Freakshow with a whole new cast of terrifying freaks including the harrowing Beast that has been unleashed upon all Dark Harbor guests. Iconic Dark Harbor mazes Deadrise, Submerged and Circus returned this year, haunted by the spirits of The Ringmaster, The Captain, Half Hatch Henry, Scary Mary and more than 200 monsters nightly. 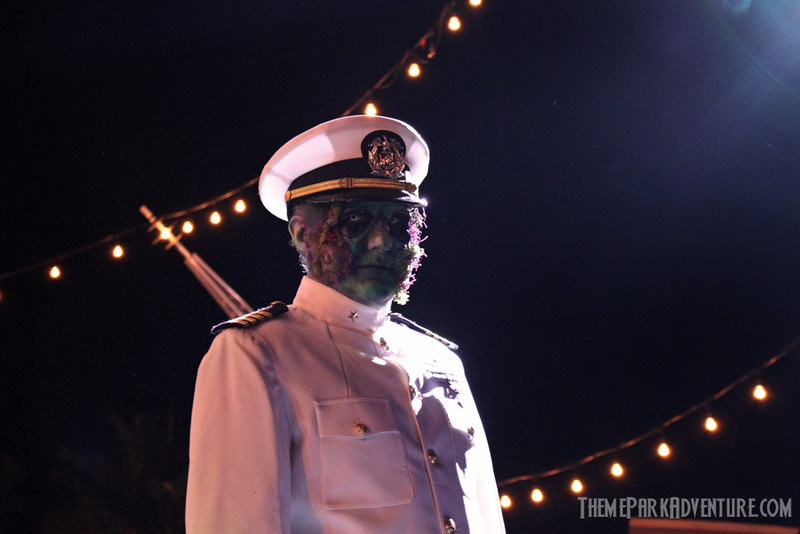 Dark Harbor presents harrowing entertainment and special ghoulish events throughout the season. A nightly show on the main stage welcomes the Queen Mary spirits showing off their terrifying talents with magic acts, circus performances, monster dance parties, fire breathing, live bands, DJs and the Dark Harbor Sliders performing the Slider Olympics down slider alley. Oct. 31 – Nov. 2 are the only evenings that Dark Harbor guests are invited to wear costumes and participate in the haunted costume contest for a chance to win a cash prize. The iconic “Jewels” will return to Dark Harbor for a special drag show and host the costume contest on Halloween night. Oct. 31 also presents the annual Little Monster’s Ball from 4-6pm with a child-friendly version of Dark Harbor complete with trick-or-treating, face painting, family entertainment and a kids’ costume contest. Kids admission is free at the Little Monster’s Ball with purchase of a $10 parent’s general admission ticket. Nov. 1 celebrates Dia de Los Muertos with special themed monsters and an entertaining parade before the closing evening of the event on Nov. 2. Dark Harbor will be open Oct. 29-Nov. 2 from 7 p.m.-12 a.m. Thurs. and Sun. nights and 7 p.m.-1 a.m. Fri.-Sat. evenings. Tickets for Sunday, October 26 and November 2 are only $19 using promo code SUN1012 when purchasing online. For more information and to purchase tickets visit www.queenmary.com/events/dark-harbor. This entry was posted in Haunted Attractions, Home Page, Home Page Slider, News and tagged Queen Mary, Queen Mary's Dark Harbor. Bookmark the permalink.